Pitted concrete is a nightmare. Perhaps you have just poured fresh concrete, a new sidewalk or you have gone through the expense of installing a decorative concrete slab. Maybe you’ve moved into a new house and you want to keep your garage floor in good repair. This one component high-gloss product takes dull looking concrete and gives it an attractive “wet” appearance while sealing and waterproofing the surface. This product can be used in a number of residential and commercial locations to restore the appearance of decorative concrete, seal and protect driveways, sidewalks and garage floors. TL8400 is a one component water based acrylic sealer that offers excellent resistance to water blushing without the objectionable solvent odors associated with solvent based sealers. This product has a fast set time and good stain resistance. Excellent product for use in decorative concrete market. Recommended for sealing concrete or cement. Do not use in immersion service or constant chemical exposure areas. Rating key: (film damage) 1 = severe -> 5 = no damage. Rating key: 10 = excellent stain resistance -> 0 = no stain resistance. None required. Multiple coats of this product are compatible. Clarity of color or gloss may be affected by high humidity, low temperatures or chemical exposure. Lighting like sodium vapor lights may affect color. For best results use a good quality 3/8” nap roller. Do not apply this product to areas where there is standing water, damp concrete can be coated. Too thick of an application may result in solvent entrapment and subsequent product failure. Physical properties listed on this technical data sheet are typical values and not specifications. 1) PRODUCT STORAGE: Store product in an area so as to bring the material to normal room temperature before using. Continuous storage should be between 60 and 90 degree F. Keep from freezing. 2) SURFACE PREPARATION: Surface preparation will vary according to the type of substrate. For a one or two coat thin build application (3-8 mils wet) we recommend either mechanical scarification or acid etching until a suitable profile is achieved. All dirt, oil, dust, foreign contaminants and laitance must be removed to assure a trouble free bond to the substrate. A test should be made to determine that the concrete has an appropriate vapor barrier. This can be done by placing a 4’X4’ plastic sheet on the substrate and taping down the edges. If after 24 hours, the substrate is still dry below the plastic sheet, then the substrate does not show signs of eventual hydrostatic pressure problems that may later cause disbonding. However, this product can be applied to a damp floor as long as there are not standing puddles. 3) PRODUCT MIXING: This product should be stirred well before using. Mix with slow speed mixing equipment to avoid introducing air into the material. 4) PRODUCT APPLICATION: The material can be applied by brush or roller. Maintain temperatures and humidity within the recommended ranges during the application and curing process. 5) RECOAT OR TOPCOATING: If you opt to recoat this product, you must first be sure that all of the solvents and water have evaporated from the coating during the curing process. The information on the front side are reliable guidelines to follow. However, it is best to test the coating before recoating. This can be done by pressing on the coating with your thumb to verify that no fingerprint impression is left. If no impression is created, then the recoat or topcoat can be started. Always remember that colder temperatures will require more cure time for the product before recoating can commence. 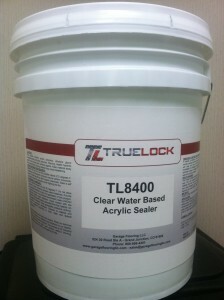 We do not recommend any coatings be placed over this product except multiple coats of this product itself. We warrant that our products are manufactured to strict quality assurance specifications and that the information supplied by us is accurate to the best of our knowledge. Such information supplied about our products is not a representation or a warranty. It is supplied on the condition that you shall make your own tests to determine the suitability of our product for your particular purpose. Any use or application other than recommenced herein is the sole responsibility of the user. Listed physical properties are typical and should not be construed as specifications. NO WARRANTY IS MADE, EXPRESSED OR IMPLIED, REGARDING SUCH OTHER INFORMATION, THE DATA ON WHICH IT IS BASED, OR THE RESULTS YOU WILL OBTAIN FROM ITS USE. N0 WARRANTY IS MADE, EXPRESSED OR IMPLIED, THAT OUR PRODUCT SHALL BE MERCHANTABLE OR THAT OUR PRODUCT SHALL BE FIT FOR ANY PARTICULAR PURPOSE. NO WARRANTY IS MADE THAT THE USE OF SUCH INFORMATION OR OUR PRODUCT WILL NOT INFRINGE UPON ANY PATENT. We shall have no liability for incidental or consequential damages, direct or indirect. Our liability is limited to the net selling price of our product or the replacement of our product, at our option. Acceptance of delivery of our product means that you have accepted the terms of this warranty whether or not purchase orders or other documents state terms that vary from this warranty. No representative is authorized to make any representation or warranty or assume any other liability on our behalf with any sale of our products. Our products contain chemicals that may CAUSE SERIOUS PHYSICAL INJURY. BEFORE USING, READ THE MATERIAL SAFETY DATA SHEET AND FOLLOW ALL PRECAUTIONS TO PREVENT BODILY HARM.